got my MOT done yesterday (sailed through) but the tester seemed to make a point of how the emissions were really good - I'm sure he even said were almost none existent. so ok at 100k miles the engine should have plenty of life in it but I wouldn't have been expecting such a comment on the emissions - perhaps he meant 'for the age' ? 600 plus miles plus to a tank and no emissions. You have just single-handedly saved the planet. The whole world thanks you and will sing your name for generations to come. Caterham, did you do it again? Present your truck to the MOT station with a potato in the exhaust? As far as I know it's a smoke test only, which makes his comment a bit meaningless unless he's saying your lack of smoke is more noticeable than usual. /\ that's good news then. I don't know but what I can say a probe up the exhaust was used and seem to think he had a reading rather than just a pass or fail ie smoke or no smoke? any thoughts re; the CAT? A cat will not affect smoke. The only way at present on the diesel MOT to detect the presence or absence of the cat is visually. 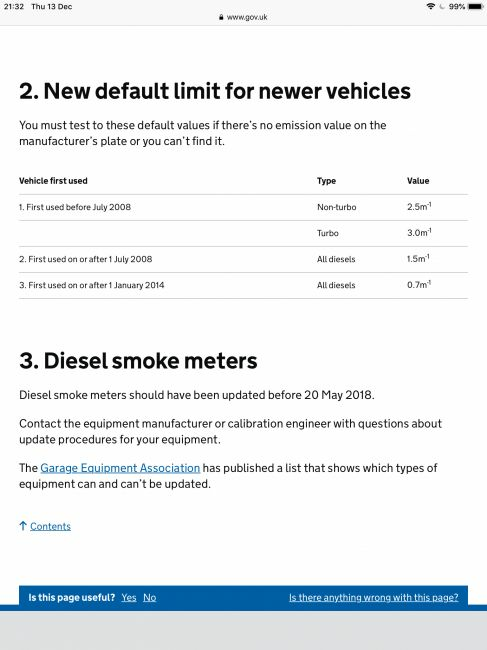 Whilst there are exhaust gas tests which can tell if the cat is present they are not part of the MOT test at the moment due (I understand) to the cost of the equipment. I am not aware of the tester ever probing my exhaust (ooh, err!) during a test, but then again I don't pay much attention to what they are doing (it's too stressful). so went back to the MOT centre and asked for a print out of the emissions for interest and for your info should you wish to make comparisons. actually this is whats on the cert. There is a huge difference in emissions limits pre June 2008 and after June 2008.